Rabbi Pinchos Lipschutz is the editor of Yated Neeman, a mouth piece for the Aguda. He is the Rabbi of Kehal Ahavas HaTorah in Monsey, and authors a blog in which he publishes weekly “Divrei Torah”. So, what are issues X and the Daas Torah views Y in this week’s regurgitation of this illogical fallacy? Metzitza is a Halachic matter. It rises above petty Agudist politics. It is an old issue. There are many respected halachic opinions that contend that Metzitza B’Peh is absolutely forbidden. Do they not have a right to those views? Are they motivated only by anti-Agudist/Orthodox motives? 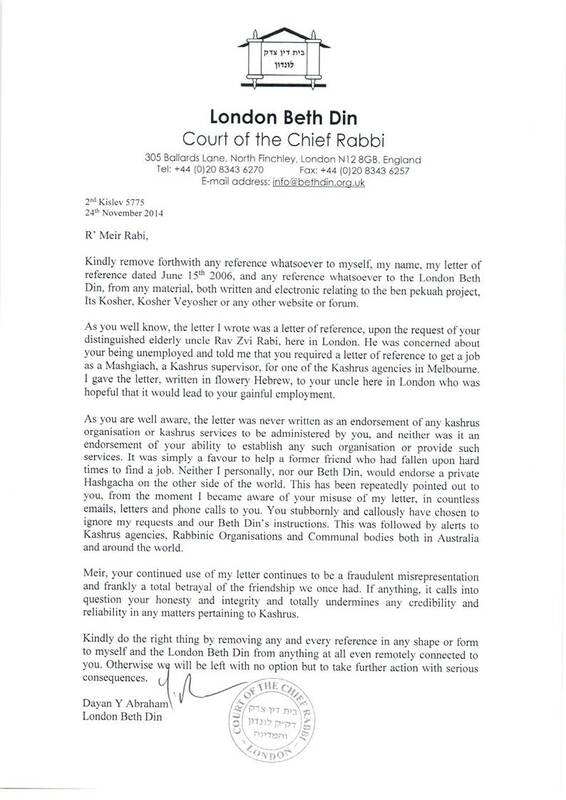 Do we not have enough evidence to suggest that Rabonim are not the best address when it comes to ascertaining whether there is a prima facie case of Abuse that should be referred to the Police? The implication here being that the RCA are like Korach? I really dislike it when the Torah is abused and misused in this way to push a barrow that discredits the right to an opinion that is different even though it had a solid basis. Anyway, you judge for yourself. Here is the Dvar Torah. We learn this week’s parsha and are struck by how odd it seems that someone would challenge Moshe after all he had done for the Bnei Yisroel altruistically. This is compounded by the number of times Hashem defended Moshe. How could someone as smart as Korach do something so foolish and how could so many people be taken in by him and join the rebellion? Miriam spoke against Moshe Rabbeinu and was promptly punished. The meraglim doubted the veracity of Moshe Rabbeinu’s promise and, again, their punishment was swift and harsh. In this week’s parsha, we are again presented with an account of rebellion against Moshe Rabbeinu. Korach is Exhibit A in the teaching of Chazal that “hakinah, hataavah vehakavod motziim es ho’odom min ho’olam.” His ambition and lust fueled him in a way that totally altered his perception of reality and truth. Rashi tells us that Korach fooled himself. His thirst for power and drive for recognition toxically combined with his ego to convince him that he was right. His ulterior motives tripped him up. Because of his negiah he thought that Moshe had appointed his brother Aharon to a high position and ignored the better candidate. Though Moshe had repeatedly proven that he was following the command of Hashem, Korach, like people who haven’t subjected their jealousy and bad middos, had lost his ability to think clearly. Ambition is good. All around us are good people who have risen to leadership positions as a result of hard work and determination. However, in the dog-eat-dog world where everything goes and the ends justify the means, people think that by trampling over others, by lying, and by playing on people’s emotions instead of by targeting their intellect, they can become popular and powerful. However, such achievement is short-lived and flames out rather quickly. Korach ran a quick and easy campaign, because hate spreads like a fire. “Did you know that…? Have you heard the truth? I’ll tell you the real story.” He used the same successful tactics, grievances and claims as today’s hate-mongers. All throughout history people have been susceptible to the machinations of demagogues. Korach deluded himself into thinking that he would be different than those who previously had made the same mistake as he and doubting the Ish Elokim. He was operating from a position brought on by negius, and thus his view was altered and his thinking fatally flawed. The Chazon Ish writes that a gadol baTorah does not make decisions based on negius and has no personal interest. Korach couldn’t face this fact. He refused to accept the reality that a true gadol doesn’t have an agenda. Rav Elazar Shach zt”l explained the concept of daas Torah as such. When a great person who has no personal negiah and is totally absorbed with his Torah study is asked a question, it is as if the Torah itself is responding to the query. Moshe Rabbeinu, the consummate humble person, the one who delivered them from slavery, virtually the only leader the Jews had known, and the man whose every word was Torah, was the person who Korach and his group accused of malfeasance. The Mishnah in Avos states that a machlokes lesheim Shomayim is sofo lehiskayeim, while a machlokes shelo lesheim Shomayim has no kiyum. The Mishnah tells us that the disputes between Hillel and Shamai were lesheim Shomayim, while the quarrel of Korach va’adaso was the quintessential machlokes shelo lesheim Shomayim, an argument that is sustained purely to serve a personal agenda. A machlokes lesheim Shomayim is fueled by the desire of both antagonists to determine the truth. Hillel and Shammai shared the same goal, but they had differing methods of interpreting and understanding the words and concepts of the Torah to determine the will of the Ribbono Shel Olam. Hillel and Shammai are so much a part of our everyday life, because by studying their drashos and sevaros, and by understanding their discussions, we are able to arrive at a more illuminated understanding of Torah. Their teachings and words endure – sofo lehiskayeim. When the machlokes is lo lesheim Shomayim, the other side is not interested in the truth. They are only interested in winning. There is nothing to be learned by dissecting their arguments, for they are illogical and obviously false. A story is told about two friends who were talmidim in the great Volozhiner Yeshiva. Meir was exceptional, brilliant and driven, and had been considered one of the yeshiva’s most accomplished students. That was before he began reading and then becoming increasingly influenced by Haskalah literature which robbed our people of thousands of promising people such as Meir. The poisoned pens of the Maskilim which mocked and disdained the holy traditions and Torah leaders succeeded and Meir found himself unable to apply himself to learning and davening. Chaim had been his chavrusah and best friend, but as Meir fell under the spell of Haskalah, their friendship fell apart. However, Meir was determined to take Chaim along with him. He sought to take his simple, unsophisticated friend by the hand and lead him into the great, big world beyond the walls of the Volozhiner Yeshiva. Chaim refused to hear his friend’s arguments, explaining that he derived all the intellectual and emotional stimulation he needed from the pages of the Gemara. Meir didn’t give up and continued hammering at Chaim with the arguments he picked up in the beautifully poetic pamphlets of the Maskilim, who used their creative gifts to carefully compose tracts that brilliantly mocked everything and everyone holy. To paraphrase the Volozhiner bochur, Hillel and Shammai are alive and well in every bais medrash in the world. Moshe’s Torah is as fresh as the day it was given at Sinai, while Korach and his group are buried deep down in a wayward desert, crying out to be heard. Hillel and Shammai pursued truth, not the argument. Their disputes were a means to arrive at the truth. Those who engage in Korach-type debates and disputes are not interested in the truth. There is nothing to be gained by debating them or studying their arguments. They are simply baalei machlokes, heirs to Korach va’adaso. Moshe Rabbeinu didn’t arrive at his leadership position by way of hubris, coup, terrorism, or taking advantage of people by forcing them to go along with him. In fact, he was the most humble person. He got there because Hashem put him there. He rose to the highest levels possible for a human. He led the Bnei Yisroel out of Mitzrayim, delivered the Torah to them, adjudicated their disputes, brought them close to Hashem, and gave them everything they needed, yet that wasn’t good enough for Korach, the members of the Sanhedrin, and the masses who followed him. It seems shocking, yet too often, today, we can hear the echoes of Korach’s cry. Sinas am ha’aretz towards talmidei chachomim is all around us. Where there are Jews, there are rabble-rousers who covet positions of power and scheme to destroy the humble talmidei chachomim and leaders who spent decades of their lives in obscurity getting closer to Hashem while working on their middos and growing in Torah and everything that is important. They are people who don’t necessarily occupy official positions, yet they become recognized by Klal Yisroel for their gadlus. And there are people who mock and fight them. It seems incompressible, but if you look back at our recent history, you see that there were people who fought against the Chofetz Chaim and called him a baal machlokes and troublemaker. Rav Chaim Ozer Grodzensky, who was not only one of the most brilliant minds the Jewish people ever saw, but also possessed the kindest and most gentle nature, was vilified by people who wanted his position. He was the rabbon shel kol bnei hagolah, father and mother of yeshivos, of the poor and forlorn, and of the almanos and yesomim, yet there were people in Vilna who fought him and ran an election to usurp his position. Though Chazal warn, “Hizaharu begachaloson,” there are always those who become overcome with envy and jealousy and delude themselves into thinking that they are more worthy for the position. They rally other malcontents to their side and do what Korach did. The lie is permitted to gain hold and none of the proud Jewish spokesmen protest. The same goes for the new focus on abuse. Rabbis who spend their days ministering to their flocks and delving into the eternal words of the Torah are portrayed as callously concerned strictly with maintaining their positions. The oft-repeated canard is that they care not about the sanctity of life. People who spend their lives caring for people are said to turn a blind eye to children who are abused. It is high time we rose up and said that we have heard that sorry song enough times. Of course every responsible rabbi agrees that predators should be prosecuted to the fullest extent of the law. Of course religious Jews maintain that monsters should not be permitted to walk the streets and destroy lives. No one who harms a child, in any way, with any type of abuse, should be coddled. Rabbis have been saying that for thousands of years, yet we are portrayed as being a group who doesn’t hear the cries of the victims. The nation that has spawned the greatest proliferation of chessed organizations, which the rest of the world never even attempts to emulate, is portrayed as uncaring and no one says anything. How can that be? When the nations of the world were still offering up their children as sacrifices to pagan gods, the Torah was concerned about ensuring that our children remain safe and healthy. Molesters are classified halachically as rodfim and are treated as such when they are caught and their reprehensible actions are proven. Yes, sometimes unfortunately, these evil people are not sufficiently punished, and those exceptions should be addressed, but how can we permit the minority to impugn the character of every rov, rosh yeshiva and frum Jew? All around us, we see the koach of Korach va’adaso taking hold, pulling people in their direction, creating doubt in the hearts of many. Their target, as always, is still Moshe Rabbeinu and those who follow his teachings. Therefore, four times a week, we rise to our feet and point towards the Sefer Torah and call out, “Vezos haTorah asher som Moshe lifnei Bnei Yisroel al pi Hashem beyad Moshe.” We proclaim our allegiance to the Torah, which guides our every step and shapes our opinions. We restate that we received it from Moshe. We point at the Torah and say, “This is timeless. This is enduring. This is real and lasting. It is the honest truth.” We received it from Moshe Rabbeinu, the humblest and greatest leader, and in every generation, the Moshes of the dor transmit the heritage to us as they lead us to grow in the lives the Torah demands of us. This Shabbos is the 30th yahrtzeit of the great Lakewood rosh yeshiva, Rav Shnuer Kotler zt”l. His father, Rav Aharon zt”l, breathed life into dry bones, creating a European-style yeshiva in a place no one thought it possible, working with superhuman energy and dedication, experiencing extraordinary siyata diShmaya. When Rav Aharon passed away, it was feared that his many accomplishments and the yeshiva he had established would be lost. Yet, providentially, Rav Shneur led Lakewood into its glory era, increasing the numbers and the breadth of limudim, and leading the kollel movement in its spread across America. Rav Aharon’s talmidim spread out across America and around the world, imparting his message and adding legions to the forces of Torah. Their success and his in transmitting Torah, yiras Shomayim and ahavas Yisroel to the succeeding generations are proof that Toras Moshe never grows old or stale. It remains relevant and vibrant wherever Hashgachah guides Jews. Those who follow Moshe Rabbeinu and his successors are growing and tipping the population scales. A just completed survey of New York’s Jews showed, once again, that intermarriage is on the rise. The Conservative and Reform, who a few decades ago thought they had the Orthodox beat, continue to lose adherents despite all the games they have played, from patrilineal descent to counting anyone who claims to be a Jew as a Jew. The media is surprised. The entrenched liberal power brokers are fearful. New York’s organizational leaders are worried about their future. They fret over the calamitous future predicted by the finding that 64% of New York’s Jewish children are Orthodox. The only group that is experiencing growth is the one that adheres to Toras Moshe and whose offspring is educated in the Torah way. The only guarantee for our future is provided by learning and observing the Torah. Yet, they refuse to accept that bare fact and instead engage in desperate battles against us. As they and the other modern-day Korachs use emotion, hyperbole and every tool at their disposal to get our attention and detour us from the path which led from Sinai to Yerushalayim, Yavneh, Pumpedisah, Gerona, Sefard, Ashkenaz, Volozhin, Warsaw, Slabodka, Vilna, Liadi, Berditchev, Morocco, Brisk, and so many other stations until it led to us, we need to stay focused on the truth of Moshe Rabbeinu and his modern-day successors. We dare not fall for gimmicks, charlatans and those who would lead us down the path of oblivion. We are approaching the twelve-month mark of last summer’s terrible tekufah, the weeks when we sustained blow after crippling blow. As their yahrtzeits arrive, we should focus on whom we lost and what sort of people walked amongst us in Rav Michel Yehuda Lefkowitz, Rav Yitzchok Dov Koppelman, Rav Chaim Stein and Rav Elazar Abuchatzeirah, zichronam livracha, among others. When we think about them and the lives they led, and the giants whom we merit having among us, we will be reminded even in our day that the Torah is as vibrant as ever, al pi Hashem beyad Moshe. May this summer be one of happiness and brocha, as we asked this past Shabbos in Rosh Chodesh bentching for a month of “chaim shetehei bonu ahavas Torah veyiras Shomayim,” coupled with shemuos tovos and besoros tovos for everyone, everywhere. I read this every week (I actually get the Yated – it was a gift), and have been searching for a word that can sum up the tone. “Facile” – I think you nailed it! I think what he is trying to do is PUSH the rabbis in a very non-confrontational way to establish this as the standard. It’s like he is incredulous that anyone could NOT report abuse. I think this is a good article on abuse coming from a charred publication. Next Next post: Is Milk Kosher in Melbourne?